Now I know not everyone uses stoves that rely on disposable gas canisters and this is very much a personal choice. From my perspective, I camp in a number of areas that ban liquid fuel stoves during periods of high fire danger so this forces the issue on my stove choice. While I do occasionally use hexamine stoves, I am pretty much a canister stove user. A number of years ago there was an ad on TV with the tag line ‘Oils aint oils’. The idea here was that to the untrained eye while all (car) oils looked the same, the technology behind them was different and unless you knew the difference it was hard to judge the price and quality from appearance alone. The same can be said for gas canisters. When you go into your local outdoor store and see different brands sold at different prices without any real explanation. So why is that? The main difference between the brands, apart from price, is the gas inside the cylinders. Gas canisters for hiking consist of a mix of propane and isobutane and depending on the mix, some canisters will perform better in different conditions in particular, very cold conditions in the Northern hemisphere winter and to a lesser extent in Australia when camping in sub zero/snow conditions. For most of us however, having gas canisters that deal with extreme cold isn’t an issue. However if you do need a cylinder for extremely cold conditions, then talk to your local outdoor store and seek advice on which brand to use. Cooking style – are you just boiling water or are you cooking? Is it cold weather (i.e. snow conditions). Disposable gas canisters come in a range of sizes with the common sizes being 100 gram, 230-240 grams and 450 grams. From what I have seen on the trail, the 230 grams size appears to be the most popular followed by the 450 gram size. Having said that as an integrated canister stove user (e.g. Jetboil), my/our personal choice is the 100 gram size as it not only fits inside my stove unit, it is lightweight and will last for my typical trip length. If I need a bigger gas supply, I prefer to use multiple 100 gram canisters. 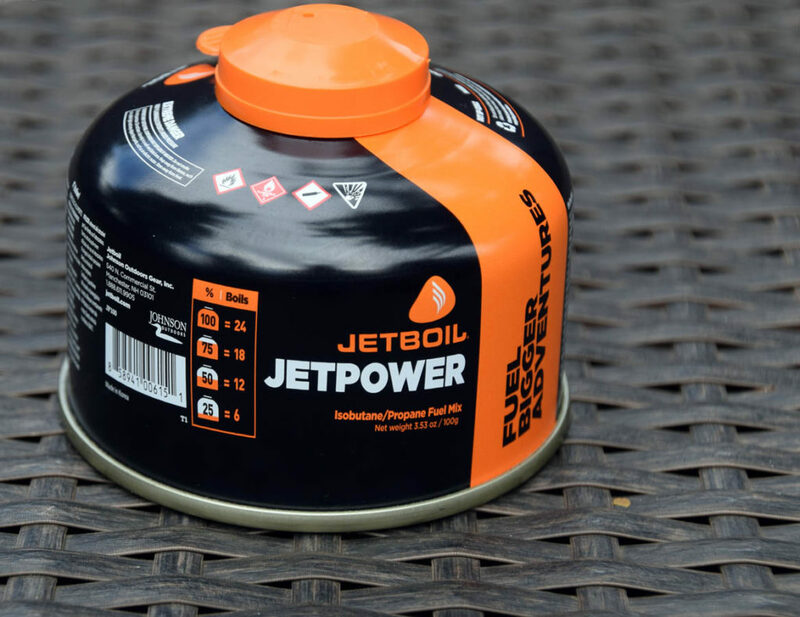 While there are a number of different brands of gas canisters on the market, I prefer to use the same brand of gas as my stove so I choose to use Jetboil gas canisters with my Jetboil stove. Failing that, I will use whatever brand is available.